Patrice Bergeron is not one for the spotlight, but as he kicked off his week by skating in the 1,000th game of his NHL career, the perennial Selke Trophy candidate made himself impossible to ignore. As tributes poured in, it was words from the teammates of the only club Bergeron has ever known that articulated the type of player No. 37 is. 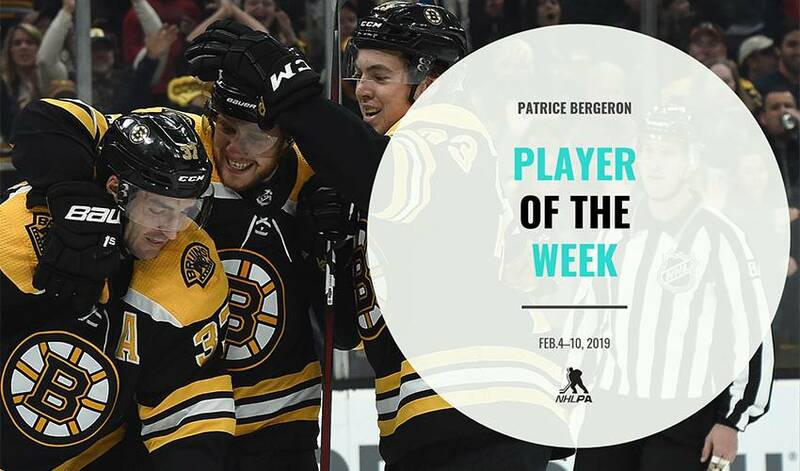 Bergeron (4-3–7) went on to co-lead the league in scoring over four games, most notably scoring a pair of goals in his millennial outing as part of two multi-point games over the week. Bergeron suited up for his 1,000th NHL game Tuesday and scored a pair of goals to help the Bruins best the New York Islanders 3-1 on home ice with the first and last goals of the game. He became the fifth Bruin to accomplish the feat behind Ray Bourque, Johnny Bucyk, Don Sweeney, and Wayne Cashman. He also became the 31st player to suit up in all 1,000 games with one team. "It feels good," Bergeron admitted to reporters postgame. "It feels good to get the win, basically. That's what I told the guys before the game. As much as it is just another game, a regular-season game, it's still a special game and something that I wanted to win, and it was a great team effort." Playing in the second half of a back-to-back, the Bruins ground out a point from a 4-3 loss in a seven-round shootout on the road to the New York Rangers. Bergeron extended his point streak with his 19th goal of the season in the second period for a 3-1 Bruins lead before the Rangers rallied in the third to force overtime. "The second of a back-to-back, sometimes when a team is coming at you, you have to weather the storm," Bergeron said postgame. "We found our legs and got better as the period went on. Good second and bad third." The Bruins headed back home to TD Garden to kick off their second back-to-back of the week with the Los Angeles Kings up first Saturday night. Before puck drop, Bergeron was honoured on home ice in a pre-game ceremony for his recent milestone, and in a true display of gamesmanship, the Kings players took to the bench in a unanimous decision. Prior to the game, the club also presented Bergeron with a $1,000 bottle of wine. Patrice Bergeron is just the fifth Bruin ever to play 1,000 games with the organization. Then it was down to business. Bergeron completed his second multi-point game of the night in dramatic fashion, scoring the overtime game-winning goal for his 20th goal of the season. "To get the win was very special," Bergeron said to reporters postgame. "That's what I said on the bench, just we've got to find a way, and we did. Obviously we'll take, I guess, that bounce getting the power play in overtime. But we stuck with it and got it done." The Bruins closed out their week the very next night with a 2-1 win at TD Garden over the Colorado Avalanche. In the club's third round of overtime for the week, Bergeron assisted on Marchand's game-winner with just 57 seconds left on the clock. Marchand credited the man of the week's skill for being able to to notch his 14th NHL career OT game-winner. "[Bergeron] had his guy beat to the net, so I figured if I could get it into [Bergeron] that he'd be able to walk across and hopefully make a play," Marchand told reporters postgame. Bergeron's next milestone moment is within striking distance as he sits just 15 points shy of reaching 800 over his NHL career. He'll take the next step towards with the Bruins' point streak sitting at seven (4-0-3) when the team hosts the Chicago Blackhawks to wrap up their homestand Feb. 12 (7:00 p.m. ET) before embarking on a five-game road trip.